Bunhybee Grasslands is in the NSW Southern Tablelands, 4km up a side-valley of the Shoalhaven River. It's 35km south of Braidwood. It's 8km almost due east of the 'Canberra' radar station on Mt Cowangerong (1358m, 35.66° S 149.51° E). It's about 14km slightly south of west from Araluen (although only if you're a bird). It lies at an altitude of between 710 and 760 metres. It's just on the Pacific side of the 1200-1300m Tallaganda Range, which is part of the Great Dividing Range. Here's a very broad area-map / satellite view. The property gained a street-address c. 2012, as 359 Jerrabattgulla Rd, Krawaree. 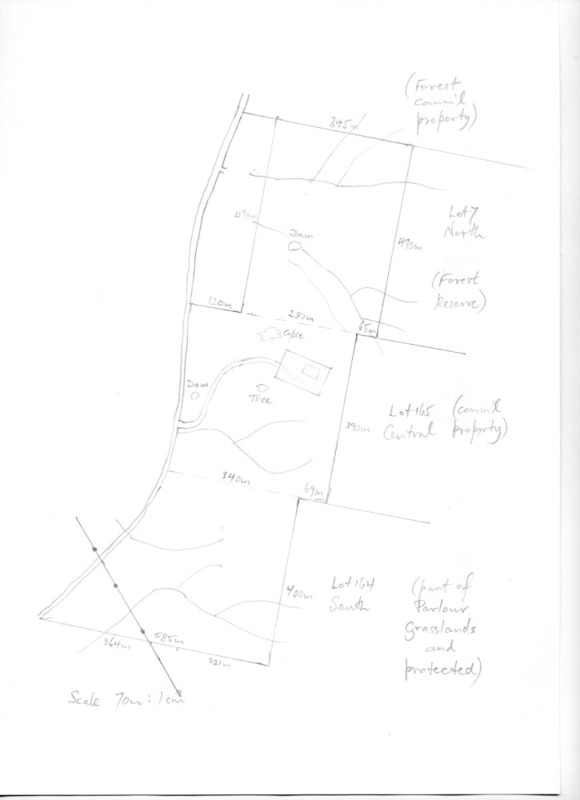 (According to the Council's surveyor, the gate is 3.59km south of the junction with Cooma / Krawaree Rd. But Google Maps can't cope with that address). 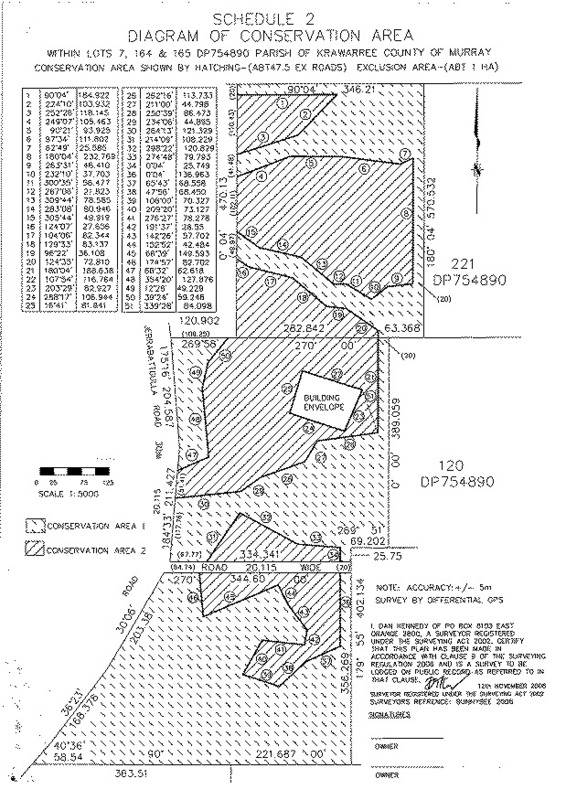 Based on the Kain 1:25,000-series map, the middle of the middle Lot (Lot 165) is at about Latitude S35/40/40 or -35.6778 and Longitude E149/46/30 or 149.6083. One set of GPS readings at the middle of the house-location gave S35/40/385, E149/36/582, and elevation 2500ft (762m) +/- 30m (all of which are verrry close to the map-coordinates). Based on experiments with Google Maps, the gate is at 35°40'27.0"S 149°36'22.0"E, and this map marks the gate, with the property extending c.700m north, c.560m south, and on average 410m east. Here is the Google Map view, centred on the nearest place-name that Google Maps recognises, which is Jerrabattgulla, a largely notional placename, 3km south of the property (where the school may have been, once). The property is bounded on the west by the 946-metre Bunhybee Peak, and on the east by Jerrabat(t)gulla Rd. It's 4km south of the intersection of Jerrabatgulla Rd with the Krawaree Rd (which runs between Braidwood and Cooma), and 1km north of the intersection with the old mail road / Harts Rd. Follow the road 0.5km past the edge of town, then turn right / southwards, towards Captain's Flat. After 25km, at the property on your right called Ballalaba, there's a right turn, westwards, to Captain's Flat. 30km from Braidwood, there's a left bend, eastwards, and a bridge over Jerrabatgulla Ck. The gate onto Bunhybee is almost exactly 4km straight down this road. Even if the gate's open, DO NOT DRIVE IN! The nearest named location on Google Maps is Jerrabattgulla, which is 3km further south. On that map, the entrance is about where the 'g' of Jerrabatgulla Rd is. Here are Google Map's directions from Braidwood to Jerrabbattgulla, but that's 3km beyond the entrance to Bunybee. The gate is at 35°40'27.0"S 149°36'22.0"E.
This map marks the gate, with the property extending c.700m north, c.500m south, and c.400m east. Even if the gate's open, DO NOT DRIVE IN! Please protect the grasslands from the seeds your vehicle inevitably carries, by parking on the (very quiet) unsealed road. There seemed to be no Bureau of Meteorology (BoM) site anywhere in the upper Shoalhaven valley, with the nearest official climate statistics being for Braidwood and Braidwood Racecourse, both c. 35km north. Trawling the BoM site finds this page for weather-station data. A search on 'Jerrabattgulla' finds the location 35.68° S, 149.58° E, and it says station 070261 is at Gilston, at 35.69° S 149.59° E (the next property south of Warragandra, 2.5 km SSW of Bunhybee Grasslands, and at 725m, i.e. the same altitude. Here are the Gilston pages for daily rainfall, and monthly rainfall, mirrored here. The extract in this spreadsheet includes a few missing months for which I've interpolated average rainfall. The property has always had limited water available for livestock. As a result, the property has always been lightly grazed. In addition, from both local knowledge and inspection, it appears to have never been improved with fertiliser, nor with non-native, higher-food-value grasses. As a result of visits by professional and amateur ecologists, and Linda's own work, we've catalogued c. 225 native species of grasses and forbs on the property, and there are only relatively small problems with weeds. There was a Water Catchment Authority study of the Upper Shoallhaven in 2008, mirrored here. There are mentions in Sydney Water Supply Quality Audits in 2005 and 2007, mirrored here, and here. 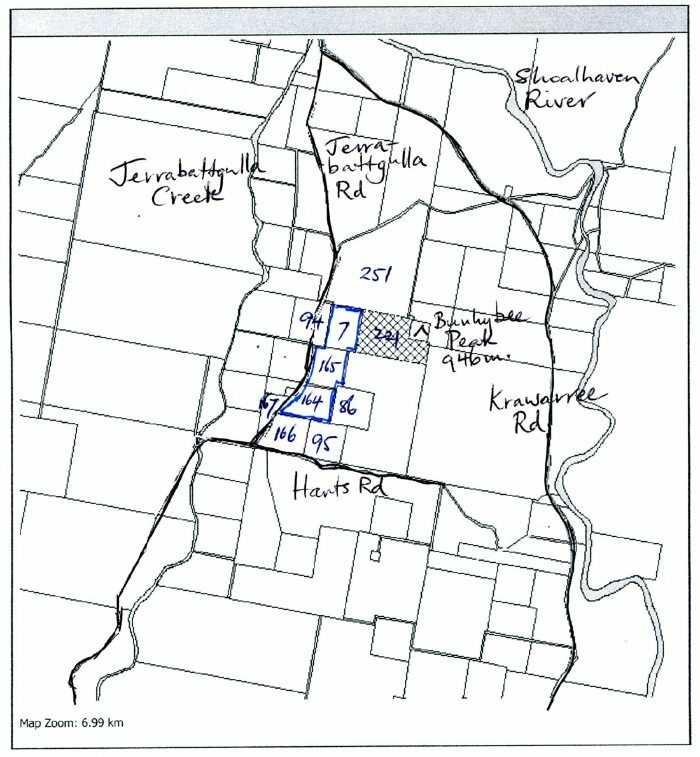 A report exists of the upper Jerrabattgulla Creek / Krawaree West area as seen from a regolith science (i.e. mining company) perspective in 2004.